Aside from Chipotle and Starbucks, I haven't eaten at a national fast food chain in, well, let's just say I can't remember the last time. 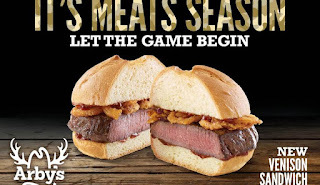 I learned too late that Arby's occasional foray into deer made a brief appearance at the newest Manhattan Arby's. The Gothamist folks reviewed it, and very favorably. I'm so bummed I missed it. I don't often eat venison, but I'd totally go to Arby's for this. I'd love to see more unusual meat at the nation's fast food chains. Everyone remembers Krusty Burger's Ribwich, for as long as that lasted.